1. Attend an audition, or submit your DVD or video. 2. You will be advised of the results of the audition within 2 days. 3. If accepted, you will be emailed an enrollment form. 4. Return the enrollment form, together with your check(s), credit card details or bank transfer. Return this as soon as possible. Every year, the enrollments of many dancers cannot be accepted, as they were received after the enrollments were filled. 5. You will then be given a link online to travel information and details of check-in, a list of what to bring, and medical forms, etc. • The audition is a regular class. No solo variation is required. • Please arrive at least 30 minutes before the scheduled time. • Neat ballet attire to be worn. If on pointe, bring pointe shoes. • Please bring a photo in 1st arabesque and $30 in cash, if not paid online. • All dancers will complete the class. No dancer is asked to leave. • Notice of acceptance will be advised within 3 days of the audition date. Audition application forms may be downloaded from the website or may be filled in when registering at the audition. • Notice of acceptance will be advised within 2 days. • Download the Audition Application Form. • Print your name and age on the DVD label. • Email your video, and application form as attachments to aaboffice@gmail.com. 1a. 1st arabesque a terre and en l’air. 1b. A la seconde position tendu a terre and en l’air. 2. 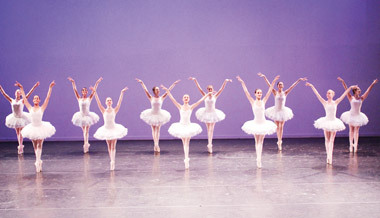 An adage combination to include a balance, arabesque line, and a developpe. 4. A Petite allegro combination. 5. A Grand allegro combination. 6. A still position showing the feet en pointe a la seconde.